Ithaca boasts nearly as many parks as it does actual gorges, so we eventually decided to start with the one closest to the side of Ithaca we'd be approaching from. We had plenty of range to go elsewhere but it just worked out that Robert H. Treman State Park was also the park we had the faintest memory of, making it worthy of revisiting. After hiking we'd treat ourselves to a local Chinese food buffet (ideal for families with growing kids) before returning home. We opted to defer our campus visit until the following day when we'd be fresher sans our hiking "patina". After breakfast I again stumbled down through the rutted fields to Serena's secluded charging spot. I was particularly happy to find that no woodland creatures had-- as far as I could tell-- seen her arrival as the new hippest place to move into. My knowledge of geology is eclipsed only by my expertise in neurosurgery so I can't really explain why Ithaca is so gorges. It just is, darn it. The rock formations are so impressively square, level and plumb that you'd think God laid the whole place out with a T-square and laser level. They're also very deep (just like the Finger Lakes themselves), which is great on a sunny day because you're always in cool shade and the water running in the bottom makes for good natural air conditioning. Several of Treman's stone bridges were under reconstruction during our visit. They'd been heavily damaged during flooding the prior year-- I can only imagine how terrifying a gorge filled with rushing water must be when it's high enough to obliterate the trail's stone bridges! Our route was slightly modified but still caught the highlight water falls and overlooks. Once you've climbed the millions of stairs it takes to get from the gorge floor to the hilltop, you're rewarded with unspoiled views. Trees in front of you, water falls behind. It is truly a spectacularly calming environment despite the geological violence necessary to gash the rock. I did mention that the Tesla excels outside the public eye, so let me explain. It is a superb car when no one is looking. With my Chrysler (for comparison) I'm keenly aware of its mechanical reverberations when puttering down quiet neighborhood streets, but the Tesla only has faint tire noise. It's as quiet as a 4800 pound bicycle. Slipping between the trees of the park on our way in and out I nearly flattened numerous chipmunks that darted in front of us, perhaps because we were too stealthy. Silent but deadly, indeed! Add in the remote ability to pre-cool the car after a hot hike (or warm it up after a cold day of skiing) and you have an outdoorsy vehicle that you appreciate even when other people aren't there. Scratch that-- ESPECIALLY when other people aren't around. The big display with the Google Earth maps is also ideal for scouting out your hiking trail heads and routes. It's the complete package. I didn't get it to impress anyone else and a quiet day of near isolation only underlines my belief that I'd want this car on my deserted island before any other. Um...though I do think I'll want some solar panels to seal the deal. Heh-- even in THAT respect it's better! Solar panels are certainly easier to install than an oil refinery. 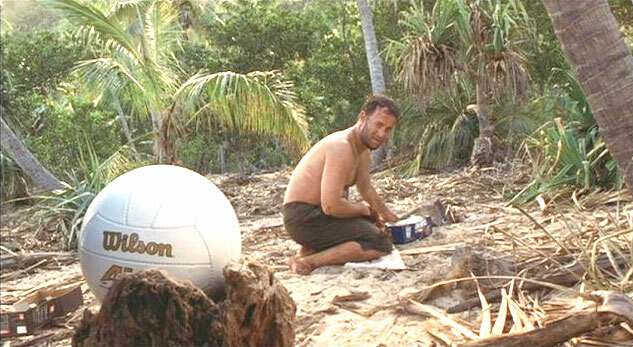 Right, Wilson? The Chinese buffet we stopped at after our hike is probably out of business now. Ithaca, please accept our apologies. My teenage son ate most of the available inventory and probably a couple place settings too. The food was good and we were doubling down by doing it after a morning of hiking that left our appetites drenched, not merely whet. Having wreaked our havoc on both the local park and economy, we headed back to home base after a quick stop at a farmer's stand for fresh produce. Gotta love fresh roadside produce picked from the fields behind the stand. Wow-- you country folk-- don't ever take this for granted! Satisfied with a day of fresh air and nature behind us, I again made the silent trek down behind the warehouse to Serena's hitching post. The sun began to set as I plugged in and began the charge. The scenery close by was full of detritus from decades of selling Finnish logging equipment but the greater surroundings were noble in their quietude. Between the steep hills these valleys were scoured table-flat by the receding ice age and, listening to the distant creek, it is hard to imagine a more fitting place to spend a quiet evening. Ithaca would be our destination again the next day. We'd be going back to the Commons and Ithaca College, parking her where we once roamed in far lesser mechanical novelties. I was looking forward to zipping up the long arduous hill to the campus without the loud drone of the Plymouth Neon I used to do it in. That would be quite satisfying. To be continued.... Click HERE for PART 4 - We've Come a Long Way, Baby, or click HERE for the beginning of this trip.